Dandy Horse Berlin is a local concept store, located on Glogauer Str. 4, in Kreuzberg. Their selection includes vintage clothing (Moschino, Versace, Fendi, etc. ), vintage bicycles and local labels. They are building a coworking space for tattoo artists inside the store and clearing out the entire collection to make room for new arrivals. In addition, together with content creator and fashion stylist Chez Amelie, who is going to teach you how to shop and integrate vintage pieces into your wardrobe. 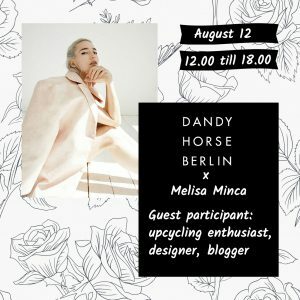 What is more, upcycling enthusiast, designer and blogger Melisa Minca is going to sell the clothes she no longer wears, so don’t miss the chance to meet her and chat with her.